Ted Christopher only had to take the green flag and the title was his. When the green flag dropped and the title was clinched, everyone's attention quickly shifted to the front of the field and to the black #22 of Chuck Hossfeld. Hossfeld made quick work of pole-sitter Charlie Pasteryak and was the class of the field for the rest of the night taking his second win of Speedweeks. But there was a point in the last 25-lapper of Speedweeks where it looked like Hossfeld would lose control. Richie Evans Memorial 100 winner Donny Lia was hot on his tail and the two made big contact heading into turn three. And run away he did. Lia looked as if he would mount another charge, but after a yellow flag Hossfeld 's DeLange #22 took control and left Lia a runner-up. 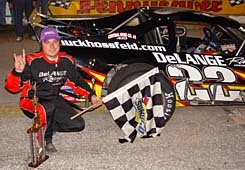 Hossfeld marched on and became the only driver besides Ted Christopher to win more than one race at Speedweeks. “I knew I had Donny and TC running me down,” said the race winner. “It was a great 25-lap race. You just go as quick as you can. It is fun to win those races and it is fun to race them. 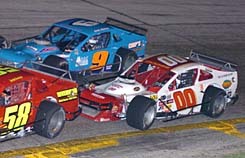 Hossfeld ended up runner-up in points to Ted Christopher. 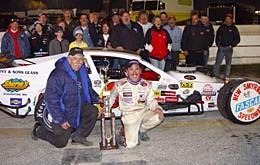 Ted Christopher is the man when it comes to Speedweeks at Smyrna and he proved that again during the 2005 edition. Time and time again the Short Track veteran comes down to Florida and brings home the hardware. Joe Brady (left) and TC (right) have now teamed up for six Speedweek titles. And TC did it in style. He used his trademark bumper, passed on the inside and outside, and came back from adversity to net four wins out of the eight races. “These are short little races and you have to be aggressive and that is what I am sometimes,” said Teddy. “Sometimes you get to win, sometimes you don’t. The King of NASCAR, Richard Petty, has seven championships in the Cup record books. Now in the Speedweeks record books, the man affectionately known by some as “King” has seven crowns of his own. “Other people do the records. I don't really pay attention to that stuff. This is seven championships now and all but one with Joe. “When you go back home and you have won that championship, people know about it. Even though you don't race against a ton of people down here like you race on the Tour up there, you go home and everyone knows what you did down here that you won Speedweeks. And sharing another Championship with car-owner Joe Brady was as special as always. And for Brady, who lives for Smyrna Speedweeks, having TC in his car makes all the difference. Brady has fielded cars for some of Modified's greatest drivers, but thinks this wheel-man is one of the greatest of all-time. “Six for six with Teddy,” said a happy Brady. “It just shows you how good of a driver he is. “We've been coming here all these years. For years we couldn't hit the side of a barn door. We came down here about 1990 with Jeff Fuller and started winning. Some little skinny kid named Steve Park came along and we won two or three championships with him and some features. “New Smyrna is basically my home track. For a few years I didn't run up north. I just ran New Smyrna down here. I don't know if it's something special about this place. Maybe it's the cold weather up north or the business things up there and this is just enjoying ourselves down here. This is a very special thing to come down here with Ted and with a brand new car and win the first night out. With all of the records piling up for TC, he's just looking forward to next year and trying to get his eighth championship and more trophies. Sparks fly as Chuck Hossfeld and Donny Lia get together on Saturday night at New Smyrna.